Pa-Ord Noodle at lunchtime has to be one of the friendliest restaurants I've eaten at in a long time. After I awkwardly attempted to order my boat noodles "pet ma," which I thought meant "sort of" spicy, a table of four young women giggled at my pitiful attempt and insisted I stick with what the server described as "medium." They taught me the word for medium, which I've now forgotten, but it turned out to be the right call as Pa-Ord's medium was just about right -- almost as spicy as I wanted, though a bit more than Kathy preferred. Then an older Thai couple started talking to us about Bangkok, since a large photo on the wall pictures the floating market with Pa-Ord's owner Lawan Bhanduram working on one of the boats. 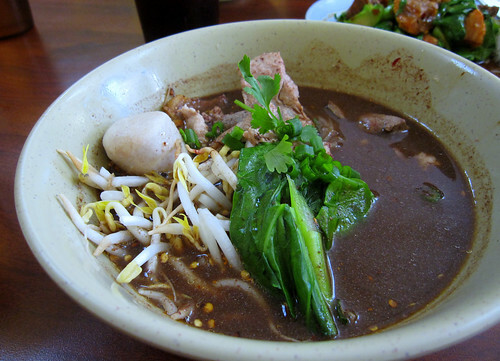 Bhanduram previously ran Ord Noodle on Hollywood Blvd., which like nearby Sapp was known for its boat noodles. I ate Thai food for several decades before attempting boat noodles, scared off by ingredients like beef blood, tripe, liver, and mysterious rubbery beef balls. When I finally tried the murkily delicious broth a few years ago, I was quickly won over by the combination of flavors like star anise, five spice powder and kaffir lime melding with strips of beef, chiles and noodles. (For a great recipe and description of the soup, see this post from Eat Drink + Be Merry). It turns out there's nothing scary about boat noodles, though I didn't actually eat the bits of liver that helped give a nice funk to the broth. At Pa-Ord, there's a choice of four types of noodles for the soups: egg noodles, wide rice noodles, thin rice noodles and even thinner rice noodles. There's also Tom-Yum soup with noodles, duck noodle soup and several other types like seafood soup and pork offal soup. The stir-fried noodle dishes like drunken noodles are fairly standard -- Pa-Ord's strength is mostly in the soups, though the papaya salad comes recommended. But don't forget your vegetables. 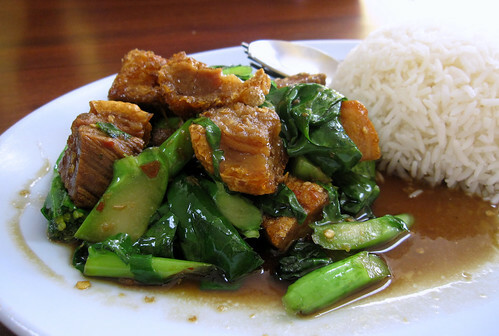 Fortunately, at Pa-Ord, the Chinese broccoli comes topped with hefty hunks of impossibly crispy pork skin. Hopefully you will not have just come from a cholesterol test at Kaiser down the street, and you will be able to carefully savor how well each cube's fatty crunch plays off the slightly bitter, somewhat spicy greens. Love this post, hungry already, like now!.